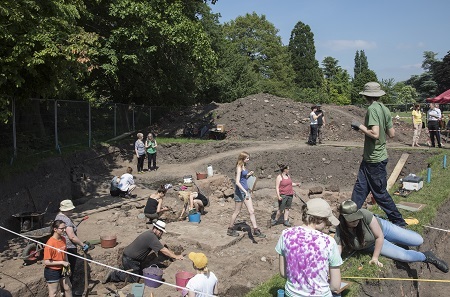 Archaeologists from Cheshire West and Chester Council in partnership with the University of Chester, complete their annual training dig for second year archaeological students this week. The training dig is an essential part of their archaeology degree course. 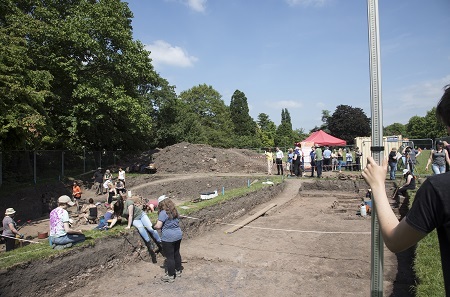 An Open Afternoon took place on May 29 giving the public the chance to see what the students have uncovered, study the objects that they have found and learn more about the history of this corner of Chester. The students have revealed a Roman road that led to the east entrance of the amphitheatre and a large building destroyed during the Civil War. The building appears to have been part of the medieval hospital and chapel of St. Anne which was acquired by Sir Hugh Cholmondeley in the late 16th century and developed as part of his mansion house. A sandstone wall marking the eastern boundary to the medieval precinct surrounding St John the Baptists church. At the western end of the trench the Roman road has been destroyed by the cutting of a large defensive ditch some 4m wide and over 1m deep. This ditch is thought to be Saxon (400-1100AD) but excavation is ongoing in the hope of recovering some dating evidence to prove this. A large sandstone block with a square socket through the centre which might be the base to a cross. Councillor Louise Gittins, Cabinet Member Communities and Wellbeing said: “Our previous digs have always attracted a lot of attention. These digs not only provide essential practical experience for students working alongside our archaeologists but have been a talking point for the many visitors to the park. Dr Caroline Pudney, Lecturer in Archaeology at the University of Chester (who recently appeared in the Channel 4 programme, Britain’s Most Historic Towns, praising the Roman history of Chester), said: “We are so lucky to have such a major archaeological site on our doorstep, and for our students to have the opportunity to contribute to our knowledge of the city’s past. Chester’s Roman history has had its public profile raised recently, as it was the focal point of the Channel 4 programme, presented by Professor Alice Roberts.